Whether you’re looking to trim down for bikini season or you need help losing weight near your midline, hiring a professional personal trainer can help you achieve your fitness and weight loss goals. 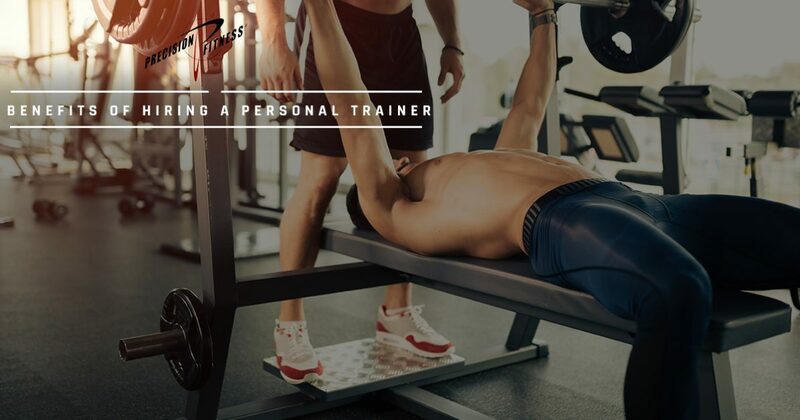 A personal trainer can help guide you through your workouts and will work with you one on one to create a customized workout plan for your needs. If you’re still on the fence about hiring a certified trainer, consider the popular benefits below. At Precision Fitness in Cornelius, we’ve successfully helped hundreds of people improve their sports performance through personal training programs and corrective exercises. If you’re interested in learning more about our training programs or you have questions regarding our athletic training services, contact us today! When you hire a certified personal trainer to help you with your workouts, you’ll notice your confidence levels start to boost over time. A personal trainer is there to provide you with encouragement, positivity, and understanding during your workout session. This will help you to feel more comfortable and confident in your own skin as you learn to push yourself both mentally and physically. When you try to workout without the help of a trainer, you are your only source of inspiration, which can get hard from time to time. As social beings, humans thrive in the presence of others, and hiring a personal trainer can only do you good. Another great benefit of hiring a personal trainer is having accountability. A good personal trainer will help hold you accountable for your workout sessions, while also acting as a motivator to push you to new heights. As humans, we are also naturally more invested in the things that we pay for, and knowing that you’re spending your hard-earned money on a personal trainer will motivate you to wake up and workout on those days when you would rather just stay in bed. While anyone can do a workout from a Men’s Health or Women’s Health magazine, it’s important to remember that these cookie cutter programs do not take your individual needs into account. Following these types of workouts without a personal trainer can lead to injuries if you aren’t familiar with the training techniques being utilized. When you sign up for a session with a personal trainer at Precision Fitness in Cornelius, our trainers will design you a customized workout based on your specific goals. If you’re like most people, your time is very valuable. Finding an hour or two to hit the gym every other day can be a challenge, but when you work with a personal trainer you don’t have to worry as much about insufficient workouts. A personal trainer can help you achieve the weight loss and fitness results you want in a much more effective manner, not to mention it’ll take less time. Are you tired of your normal workout regimen? Do you go to the gym, only to spend a long, grueling hour on the treadmill or elliptical? If you’re workouts have become bland, a personal trainer can help spruce them up. An experienced trainer will have knowledge of a variety of exercise methods, which will help keep you from getting bored at the gym. If your current workout isn’t giving you the results you want, a personal trainer can show you new exercises to help you target those trouble zones like your belly or glutes. Your trainer will also be there to make sure you perform each exercise correctly, offering adjustments when necessary. When you visit our state-of-the-art fitness center, one of our personal trainers will start you off with a comprehensive pre-training consultation and evaluation to determine your training objectives and goals. We’ll then ask you to complete a health history and lifestyle survey to assess your general fitness level and your current nutritional status. Once we have an understanding of your fitness goals and levels, we’ll perform a comprehensive physical evaluation to assess your posture, core strength, muscle balance, flexibility and movement. If you’re interested in learning more about our personal training services, contact our fitness center today!